There's been plenty of mentions of 'brave' or 'battling' Swansea but for me that doesn't do justice to the performance over the two legs. Those words suggest a 'backs to the wall', blood and guts approach when in reality we created the better chances and had control of the two games for large periods. 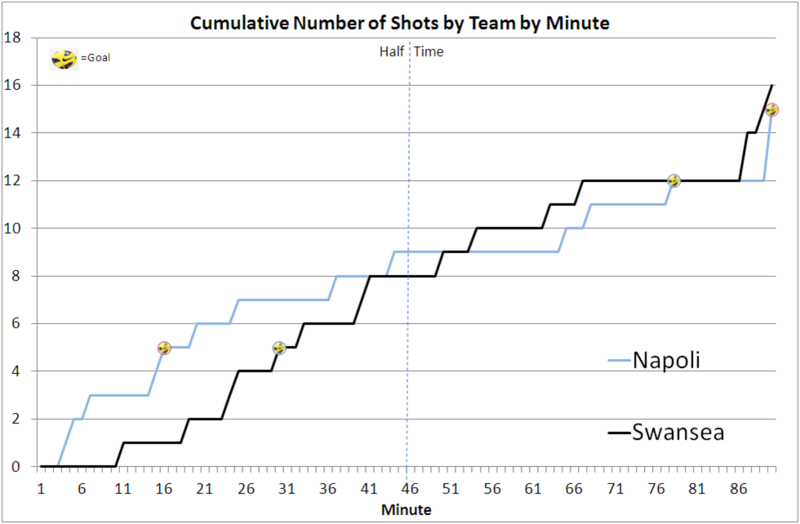 Over the two legs, Swansea had 20 shots on target to Napoli's 5, partly due to some poor attempts by Higuain. Overall the Swans will be left with plenty of if-only's but the fact that there was no discernable difference in ability of the two teams is a huge credit to the team. Sunday's game against Palace is a huge one, win and the feel-good factor continues and creates a decent sized cushion over the bottom teams, lose and it's 3 defeats in a row and people will start to get twitchy again especially given it'll be two weeks before the West Brom game with a number of other sides playing a game on 8th/9th March. The main jobs for a manager are motivation and organisation and so far Monk has shown impressive qualities which will be needed again for the Palace match. As well as the change in atmosphere, there's also been a shift in approach which I'll look in to in more detail after the Palace game. 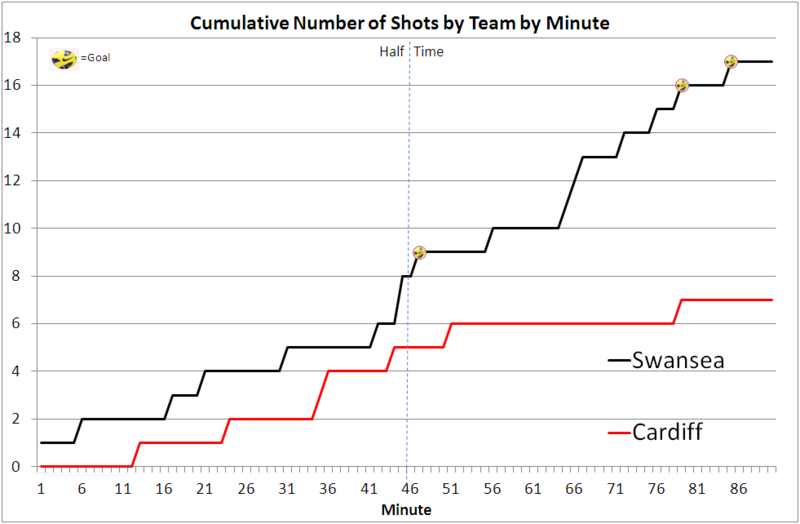 What after 20 minutes looked like it might end up us a rout, turned into another performance of a tempo and attitude that had been lacking under Laudrup. Monk may well go on to achieve great things with Swansea but sometimes a large part of any change is just not being like the old guy in charge. 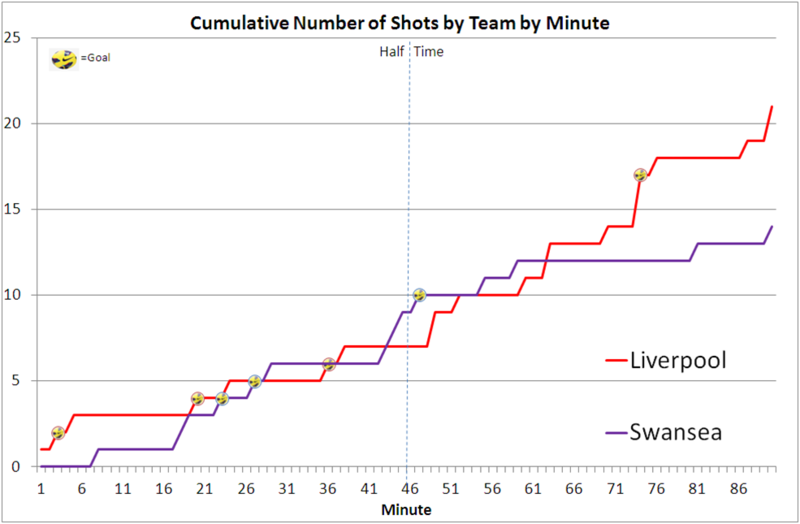 Obviously no player is going to come out and say 'I preferred it under Laudrup' but there genuinely does seem to be a greater sense that things are being done 'The Swansea Way' with increased width and pace. Obviously all this optimism could disappear pretty quickly if results against the likes of Palace and Norwich go against us but so far, so good. Liverpool FC - Interactive Chalkboards. Liverpool one of the few (possibly only) that have interactive chalkboards for their games on their website. The Super Garry Monk bandwagon keeps rolling on! There were chances to take all 3 points but to get something after being 1-0 down at half time against a team that have had comfortable 2-0 wins on our two previous visits to the Britannia is a decent result. Conditions (and the opposition) meant is was likely to be a fairly messy match but generally speaking there was plenty of control from Swansea with Nathan Dyer in particular in great form. Dyer attempted 14 take-ons, 8 more than the next highest player (Pablo). He was also the most fouled player with Charlie Adam being the player making the most fouls (4). Under Monk the wingers certainly seem to stay out wide more, the chalkboard below compares Dyer against Stoke along with Dyer against West Ham a couple of weeks ago. There shouldn't be too much revisionism with regards to how we played under Laudrup but it certainly feels a more 'natural' approach with increased width and a greater amount of pressing. Time will tell about the decision to sack Laudrup and bring in Monk but so far, so good! I'm not normally a defender of Robbie Savage but I didn't understand why he ended up getting so much stick on Twitter for saying that it was an 'easy' game for Monk to have as his first match, his point being that the whole City was up for this match, it may be harder on the cliched rainy Wednesday night in Stoke. I never get tired of this picture, I admit it wouldn't be funny if he'd broken his legs, but he didn't so it is. That said, Monk certainly did a few things different to how things have been recently (good corners for a start), there seemed to be more width and it seemed as if everyone was lining up to take turns in trying to get past Fabio. I don't know if it was because I was particularly looking out for it but the long diagonal from Ash to Dyer seemed to be back. It may be that Laudrup would still be in a job if he'd picked Leon against West Ham, not just because of Leon's ability but it felt like an over-reaction to West Ham's threat, Amat was there to clear up the second ball from any Carroll knock downs but anticipation is one of Leon's may strong points and I can't imagine him ball watching and ignoring Noble as Amat did for West Ham's first. After a fairly cagey first half there was only really one team in it in the second half (Bellamy's long range effort that hit the crossbar excepted). I thought Emnes impressed with his work rate in the first half but some of Pablo's play in the 2nd half showed why it's so frustrating when it doesn't work out. The Laudrup era provided some truly great moments and it's a real shame it couldn't have all happened at the end of the season on much more amicable terms. Before he got sacked I was planning to write a piece comparing the situation to a relationship that had just fizzled out and whether there were grounds for divorce. Ultimately results drive attitudes, I doubt Laudrup's approach changed much over his tenure, but what's considered calm and relaxed when you're winning is considered lazy when results aren't great (and it doesn't help when your closest associate calls the chairman a liar and you say it's nothing to do with you). Huw Jenkins obviously felt it had gone far enough and felt a clean start was best rather than dragging it out over the next few months, but that shouldn't overshadow the good times. Laudrup had a chequered CV before he joined us but everyone was doing cartwheels when he joined. He's still got a chequered CV but also a trophy and will probably make another club very happy for 12-18 months or so. At this stage of the season points are more important than performance but when you've got neither it makes for a long week before the derby next Saturday. The main talking point will probably be Chico getting Carroll sent off. I think there was enough intent there that it won't get rescinded but it's hard to defend Chico's actions and he's gone from being a 'character' last season to somebody who's done this kind of thing far too often this season. There were arguably two main things that were disappointing from the performance, the first being not so much how we dealt with Carroll but how we dealt with the knock downs from him for the two goals. It's no surprise that Carroll was dominant in the air but that wakes it even more obvious that the key threat will be from who he heads to more than Carroll himself. West Ham's highest passing combination was keeper Adrian up to Carroll, it may not be the prettiest but I'm sure Allardyce would argue if it ain't broke don't try to fix it. 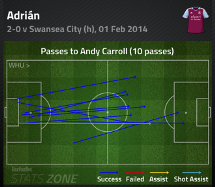 Adrian stats include a Key Pass via a Goal Kick, literally cutting out the middle men. 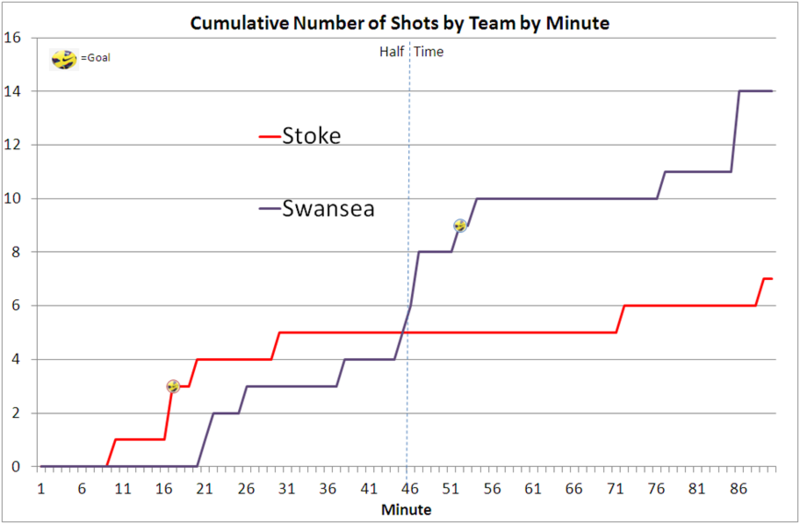 The second area that was poor was the lack of chances created, especially playing over half an hour with an extra man - although arguably 5-10 minutes of that was practically 10v10 as Shelvey was hobbling around. It seems to have happened a few times this season where it's seemed an age before an obviously injured player is subbed even allowing for time for a sub to get ready (and the ball to go out of play, things seem to have been slow). 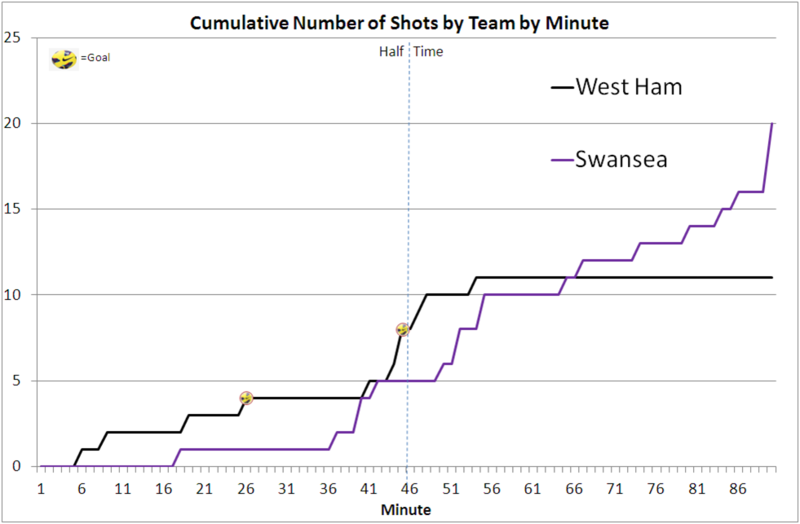 The overall shot count may look OK but that hides both the fact that Swansea failed to hit the target and that most of the activity came after West Ham were already 2 up and down to 10-men. As West Ham showed against Chelsea a few days earlier, if you're set up purely to defend, if you're well organised it's extremely difficult to break down but not even testing the keeper is not great. Bony is great in the air but there's only one of him surrounded by a load of defenders, crossing may well be the best option but gently lofted balls in to the box are unlikely to be of much use even if they do get through to him, it seemed the last half hour was a loop of couple of passes, dink it in, ball gets cleared and repeat. There are arguably 11 teams in the league who on their day can look half-decent but their day comes along far too infrequently. It's going to be a very long week.